92 p., 5 leaves of plates : col. ill. ; 20 cm. by Henrietta Christian Wright ; illustrations in color by Lydia Emmet. : ... _ :. 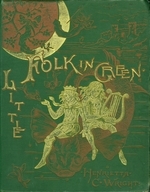 i Lro' "
brightly in the room where little Peterkin lay asleep. you may go with him to see the great tree cut down ? seemed whispering strange things to each other.
" You, sun, what have you done with all your gold ? points of the stars be covered with gold ?" But the sun did not answer the little boy's questions. you, shall we have a little talk? " Who are you?" said Peterkin. think you'd be afraid of the fishes ? " down we can have some merry games." give you a string of pretty shells." But I don't know how to," answered Peterkin. Oh, just jump right in, and I'll take care of you,"
and said, Now you are all right, come with me." slowly through the water until it reached the children. of stairs running down through it. the tiny stairs, which ended in a large, beautiful room. embroidered with pearls, and all wore on their heads. round forever in this beautiful circle, and never tire. cing, and, taking his harp, sat down, and began to play. went to the strange boy's side, and sat down also. Peterkin got on its back, and went floating away. comes; fishes do not have trundle beds, do they ? " want to go home very much. see his kind, little brother again. all in green, with pearls and golden crowns." never let him leave them again. And down comes a little dream on thee,"
has nothing to wear to such a party." she thought it looked lonesome away off up there. dipped one of its horns a little bit of a way in answer. But to-night she did not speak, she was too miserable. "Why are you so sad, little girl ?" he said timidly. spirit, who all at once seemed very large and strong. No," said Greta, "and it's only a day off." "Well, we'll see, we'll see," said the wind spirit. now, what would you like to wear to the party ? " little spirit. I think I know where one could be had." that they seemed to light the tree-top all up. Very well," said the wind spirit, "then we'll go." were dropped right into the moon. a little, as if it heard her. So they went sailing on. since they had left the tree-top, the wind spirit spoke. do not doubt you will find something nice for a dress." But we have seen lots of clouds already," said Greta. Oh, yes; but those you saw were nothing to this. had never seen anything so lovely. Come," said the little spirit, we will get out." around, looking very curiously at Greta. You see this little girl," said the wind spirit. "Now, begin," said the wind spirit. girl had to fall behind. Now," said the wind spirit, "let it rain." not touch the wind spirit or Greta. A necklace for the little girl," said the spirit. them a song something like this. Have we in our domains. How very mean to rain.' "
That is the evening star," said the wind spirit. How lovely," said Greta. We will stop here,"
said he. So they went up to the star. A beautiful night," said the wind spirit. The star sent out little glints of light in answer. I want some spangles for it." can have them," said the spirit. So he took Greta to the star's treasure-house. Greta. They glittered like sparks of fire. and the star shone brighter than ever. Still, it is not pink," said the wind spirit to himself. Just then a line of light shot up in the east. all red and golden, and knew the sun was setting. The little spirit waked up, too. Ah !" said he, if I only had a bit of that now." way, as if in encouragement. quite such a sunset before. The little wind spirit began to get excited. I will ask my brothers to help," said he. Greta's dress and rested there; that too became pink. The wind spirit was satisfied. A pink dress with spangles, now it is all right,"
To-night is the party; but there is plenty of time. Is there anything you would like very much to see ?" a crown; but she did not know it. The wind spirit smiled, but said nothing. or you will lose the party." See mamma, I can go to the party," said she. Then she told her all about her journey. colors around the child's head. abject appearance. Her bead eyes had a glazed look. pathy kept all the dolls from laughing aloud at him. tuous action would be rewarded at last. manner, privately resolving to be more polite in future. of the Old-Fashioned Doll herself. come next for one of us." The New Doll turned pale. latan, "amount to very little." Just now, however, things brightened a little for her. lone victim in the corner. never shown that dog anything but kindness ? " Nip was poking his nose inquisitively in her face. so ill." Here they all looked very much astonished. confessed that life was anything but pleasant to her. And you ?" she said. that it is constantly getting me into trouble." pression, sat up, and wagged his paws affably. "because it is well-known that there is not a family on. word to say in return. difficulty by holding it straight in the air at all times. Well, I never! exclaimed the Old-Fashioned Doll. on the floor, and wrung her hands in misery. least, was contented with the change. And Nip. Never was a dog so well pleased as he. And now we will leave them for a month. the end of the time. and dust this room I know I should be perfectly happy. makes people happy, at least it would make me so." window were all the changes she allowed herself. Otherwise the new clothes would have suffered. obliged to be still all day for fear of soiling my clothes. If I had only known this before! " dolls was nothing in comparison with her lot now. don, very handsomely, for having nipped her fingers. creature, how she ever gets into it is a mystery to me. feelings by an allusion to something she can't help. able to say anything, and simply lay, and moaned. on, So well disposed toward one another, I mean." said: "Well, I suppose, you are perfectly happy? is, if you are willing." is not to be idle." even if it be not the thing that one wants the most." means," and he sighed painfully. never be necessary for me to try it again." deep in the rug. And so we leave them. to the moon, I know. I'll give him the box." Ah, yes, an easy thing, Jack; a very easy thing." impossible for me," answered Jack. hard to climb; but now, how could he ever get there? long journey, I may as well start as soon as I can,"
Peter led him out into the back part of his garden. himself than the boat began to rise slowly in the air. politely, Pray, can you tell me where we are going ?" again three times, after which he handed him a letter. of the castle, and allow him to retain his position there. may you both be ever happy and prosperous. THE (FORMER) KEEPER OF THE KEY." stood a lofty castle glittering with a thousand lights. out of the boat. They had really reached the moon. And now Jack began to feel uneasy about his dress. very low, and said: "You are very welcome, prince. floor itself was of marble, inlaid with gold and silver. making the whole place sweet with their perfume. a brave and good boy. though you do not know it, this room is full of fairies. dresses. How I wish you could have seen them! beautiful that I cannot describe them. and get it for me." But," said Jack, "why are you afraid of the queen ? shall I find it? " of going back without Fairy Bell. Oh, the ring, the ring answered Jack. "But I had it, really, really," said he to Peter. see," said Jack, rushing from the house. But, alas! fairy boat or grave little elf had ever been there. that dreadful castle," as Jack now called it. have been so careless; how could I "
by Jack's distress, and so he went up to him, and said,. That last word touched Jack's already sensitive heart. and then began crying again, harder than ever. that Peter should laugh at him. I cannot blame him. Well, Jack, what is to be done.?" would help him after all. queer little room, you say you had that key ? "And that you lost it? " "And that you cannot find it? " For the third time Jack said Yes." And yet you do not ask me to help you ?" But Jack had had a revelation. breast, and bowed humbly three times. Did it drop from the sky ?" he asked. may as well suppose that as anything else." but first I must say good-by." until she reached the room in the highest tower. a different one from every fairy; and so she left them. stepped into the little boat. He looked very sad. with them to the earth; but he shook his head. and the glittering castle and the old man. known him all her life, which quite astonished Jack? friends had come down on the earth to live near her ? head a velvet cushion on which lay a tiny golden key? Bell, and the gentlemen shook hands with Jack,. life had begun for Fairy Bell. cheeks in a quiet, little way that she liked very much. dandelions. Do you see that little girl in the swing? queen of the Golden Island." out of sight of the castle." Then a grasshopper flew up on Jasmine's dress. away, meddlesome insect, I will tell Jasmine myself." to the garden wall. Over this wall grew a rose-tree. heart of the rose was their council chamber. hand. All the other fairies were kneeling around her. messenger, and tell us what news thou bringest." is fit to be queen of the Golden Island." be crowned queen of the Golden Island." the fairies will not listen to this side of the story. will see before this story is ended. trembling to their very roots. he did not believe it, and would ask Jasmine himself. with me to the Golden Island." but tell me where is the Golden Island? " afraid to say a word to them. growing some dainty violets. They never associated. seem like a thought of heaven. kept going down, lower and lower. And the bees flew home, and went to bed. come with me to the Golden Island." sun had just gone down. Banked up in the west lay the golden clouds. a bit too good to be sent to live with the grasshoppers. say, "Don't you know me?" At the palace gates stood the queen of the fairies. Jasmine, Queen of the Golden Island." had been given one as before. the silver lake ?" said the queen, sternly. "Then, why have you not done so ? said the queen. all the rest very sad. in the halls of this palace." the queen to forgive her just once more. too many times; I cannot forgive you." thing you would like to have us do for you ? " would forever have everything I wish ?" to obey you when you hold out your sceptre." her to her former position." Which she did, and was never sorry for it either. though they could not tell Jasmine. * r. . ; "! I 'I c h "